Today is the third and final instalment in our membership series. Miak began the series two weeks ago by looking at the kind of church that FCC is called to build. 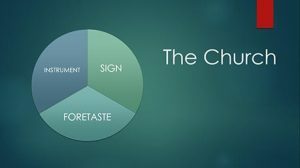 This is core to membership because it represents our identity as a church, our approach to being the church (or ecclesiology), our unique fingerprint in the wider church. He looked at WHAT we are called to do, WHY we are called to do it and HOW we will do it. Do you remember what he shared? He gave us a simple way to remember it. Do you remember what’s “3, 4, 5”? 1.HEALING – an environment of healing where we can find support as we reconcile our faith and sexuality, as we move us into wholeness spiritually, physically, mentally, emotionally. 2.WELCOMING – an environment where we are welcomed and we welcome and include others who may not be like us into our family. 3.LEARNING – an environment where we engage scripture, developing our understanding of who God is and what God calls us to do in the way we live out and lead our lives. 4.LIBERATING – an environment where we witness and act against injustice, oppression, stewarding and caring for the world we live in, being the hands and feet of Christ to bless and transform the world. 5.THIRIVING – an environment where we are equipping and enabling others to discover their calling and live out their passion, to be fully alive, to experience the abundant life that Christ came to bring. All the activities we do as a church map to one or more these areas. So that is the “5”. What about the “4”? The “4” is about WHY we do what we do. We do the WHAT in response to the love that is given to us. 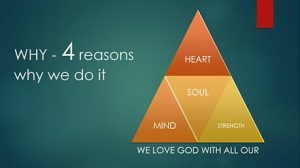 We do this because we are called to love the Lord our God with all our HEART, MIND, SOUL and STRENGTH. And the “3” is HOW we do it – As we move from SOLITUDE (building the vertical relationship with God) to COMMUNITY (building that horizontal relationships within the church) to MINISTRY (building that outward relationships to the other). 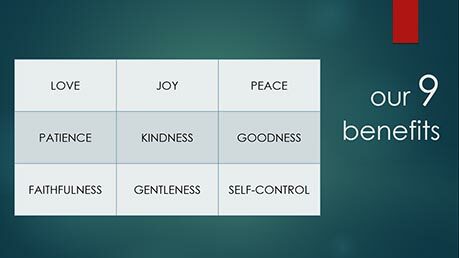 Then last week, Susan focused on what it means for us to be a COMMUNITY and how we can heal, welcome, learn, liberate and thrive together as a COMMUNITY as we commit to our Principles of Community Life. She helped us reframe our understanding Christian community, how it differs from the traditional understanding of community. That it is not about choosing people like us, but that the people who we have an opportunity to be interact with are given to us by grace. That like any relationship to work well, it is a commitment and a struggle. While you come in to experience what the church is, guess what, you will be hurt, people will rub you the wrong way, you may not get all your needs met when you need it to be met because we are imperfect, fallen people. There is not perfect church! That a community is a place where we are accepted and we accept others, but at the same time we are accountable to others and others are accountable to us. That here God’s will is done, not ours. Where we are blessed to be broken, and broken to be given. And that where through the interactions and activities, faith is inspired, energized, and released. And so because we are called to community with one another and because we understand the kind of community we need to become, we have our COMMUNITY LIFE PRINCIPLES for our members as a church to commit and to live by as part of our membership covenant. Today we are going to look at the third instalment of this series, which is MEMBERSHIP AND LEADERSHIP in FCC. This will wrap up the series and the requirements for membership in FCC. Before we begin, I want to ask you a question, how many of you here see yourself as a leader in FCC? Don’t raise your hands first! While you are thinking about it, let’s go to our foundation scriptures for today. We will be reading two passages – the first from Eph 4:1-16 and the second will be from Matt 28:19-20. The first is a letter to the church in Ephesus was written by the Apostle Paul near the end of his life and contains his reflections on how to be the church. To give it a modern flavour, I will be reading from the Message version. Is it not true that the One who climbed up also climbed down, down to the valley of earth? And the One who climbed down is the One who climbed back up, up to highest heaven. He handed out gifts above and below, filled heaven with his gifts, filled earth with his gifts. He handed out gifts of apostle, prophet, evangelist, pastor and teacher to train Christ’s followers in skilled servant work, working within Christ’s body, the church, until we’re all moving rhythmically and easily with each other, efficient and graceful in response to God’s Son, fully mature adults, fully developed within and without, fully alive like Christ. The second passage of scripture is from Matt 28:19-20, something that should be familiar to those who have been church for a while. So, as we begin today’s session, for those here today who are considering membership in FCC, I want to first ask how many here see yourself as a leader in FCC? Quick raise of hands? Today we will be looking at membership and leadership in FCC. The effectiveness of a church lives and dies by its leadership. When you live out the Great Commission, to go therefore and make disciples of ALL NATIONS, guess what, you are going to have a lot of people that will we will have the opportunity to encounter and to be ministered to through the range of activities. There will always be more people out there in the nations, or even bringing it closer to home, the relationships in our lives who will come into contact with one of the activities that we have and receive ministry from members of this church. And that’s exactly what the church does – as a church we are called to do those 5 things – heal, welcome, learn, liberate and thrive. So in order for the church to be effective, we need to understand how we are setting up leadership to work and how leadership should work in the church. Can you imagine a church where there are a lot of people coming through the doors, and very few leaders? What do you think will happen? The few leaders will not be able to meet all the needs of the people and their effectiveness is limited, and they may ending up getting burnt out. And for those who come through the doors don’t stay because they don’t receive the ministry they seek – the healing, welcoming, learning, liberating and thriving and they leave to find a better church or they leave Christianity entirely. Leadership is critical in the church – the church is effective or ineffective by its leadership. Another reason why leadership is critical in the church is that Jesus’ mission on earth is breaking in the kingdom of God into all aspects of life. It is inherently counter-cultural. Without leadership in community, the natural gravitation of the church is also always towards the dominant culture – the Kingdom of the World and inwards towards its own congregation. So let’s first build an understanding of what leadership is. In many churches, the Senior Pastor or Executive Pastor is usually the most recognized leader in a church. Maybe the worship leaders are the most visible leaders in the church. They run the church and the service. But is that what leadership really is? So I would first like to share something called the three modes of leadership. There are three modes of leadership that operates in FCC – LEADING YOURSELF; LEADING MINISTRY TEAMS; and LEADING THE CHURCH. Leading yourself moves one from “what can the church do for me” to “what can I do for the church”? You may say “isn’t that ministry?” And the answer is yes. But ministry only happens when you lead yourself. You have to organize your time, your finances, your priorities to lead yourself. You have not just purpose to do something, you need to figure out what that “something” is, and then act on it. Miak shared in the first membership session that the word “discipleship” and “discipline” are the same word. Once you make a choice to be a disciple of Christ – a Christ-follower, you now need to act. And that involves making decisions to organize what you want to do, really, really know why you want to do it, and how you want to do it. And that is leading yourself. So a common question that Christians ask is “what is that ‘something’ I am supposed to do?” Or sometimes, people phrase it this way – “What is the call of God on my life?” Asking that question is a really good place to start. When I am asked this question, rather than giving a prescriptive answer, I would in turn ask them to weigh whatever they are consider to be involved in against these guidelines. And it begins by asking yourself: am I breaking in the Kingdom of God, or am I perpetuating the Kingdom of the World (or popular culture). Ask yourself: is it for my benefit or my reward? Or is it for God’s glory and to reflect who God’s is in that situation. Am I aligned with the mission of God, to set things right in a broken world, to redeem the world and restore it to its intended purpose? And am I aligned to what the church is then called to act being those hands and feet of Christ – to heal, welcome, learn, liberate, thrive? And that requires the ability to discern and lead yourself. For the church to be effective, our mission as individuals must be collectively aligned, prioritized and resourced in line with the priorities of the God. The church exists to fulfil God’s mission, and when we participate in God’s mission we become living signs of God’s intended future for the world, bringing glory to God. So a church that is not participating in God’s mission or is on some other mission ceases to be a church. 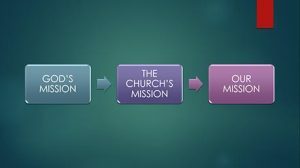 And a church (the community of Christ-followers) that purposefully aligns its mission with God’s mission and sets itself up to enable that mission to its fullest potential is being the church. This is something that is very important for us to catch today and I want to spend a few moments to expand on this. In the mission of God, the church should become a SIGN, a FORETASTE, and an INSTRUMENT by which the Kingdom of God breaks into the earth. Firstly, A SIGN – Jesus says “You are the light of the world”. What do you reflect in your life? What kind of sign are we becoming? Next, A FORETASTE – The church should be a foretaste of what life will be like in its fullness when we operate counter cultural to the world in the way we love one another, hold one another accountable, encourage one another, forgive one another. It’s in community that the kingdom becomes real. Finally, AN INSTRUMENT. In Ephesians 3:10-11, the Apostle Paul talks about how the church is God’s chosen instrument to show the wisdom and grace of God. The church is an instrument through which God’s will for justice, peace and freedom is done in the world. In 20 years, those who identify as non-religious and want to have nothing to do with Christianity has grown by 7%. And those who identify are Christians, have fallen by 11%. In Singapore, we see that there has been an increase in Christianity in Singapore largely due to the ministry of the independent churches (who actually have done quite well in many of the areas of WHAT it means to be a church) but at the same time, there is a similar increase in non-religious. Why is this? Because Christians, communities and the church has stopped being effective in being the good news. We are not being a sign, a foretaste or an instrument. And that is because discipleship and leadership go hand in hand. Many Christians today do not see themselves as leaders. Each church will be evaluated ultimately by one thing – its disciples. Not just the music, the preaching, the programmes or the building. If the followers of Christ in this body are passive, inward-looking, consumeristic, timid, FCC is not going to be fulfilling its mission in the mission of God. The Great Commission that Jesus left is to go into the world and make disciples (followers of Christ who are leaders) of all nations (and all people), teaching them (organizing and leading them to be equipped, released and accountable) to obey everything I have taught (about the Kingdom of God, about how Jesus lived His life), and so (Jesus) will be with you (the living God’s presence is with you to enable this) to the end of the age. 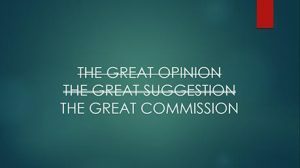 It is not the Great Suggestion or the Great Opinion. 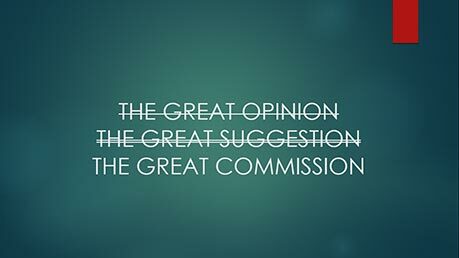 It is the Great Commission. As churches, we end up marrying a church model and flirt with the Great Commission. And this transformation can’t happen alone. We need community to allow this transformation to happen as we embrace and discern the work of the Spirit in our lives together. It is really not in the trying; it’s in the surrendering, and obeying. Like a sailboat catching the wind of the Spirit. You look at the activities we have done as a church. We don’t have a detailed 3 or 5 year plan. We know generally the purpose for our existence and what the call of the church is. But the how, and the timing, is all about coming together and catching the wind of the Spirit together and committing to one another. As a church, we are called to develop a community and develop in community. When we minister as a community through the different activities and rhythms of church life like our Sunday Service and cell groups, the things we do engage our senses, grab our hearts, form our identities, reshape our desires towards God and God’s mission. As we have aligned objectives and activities, you will find yourself having to operate in the second mode of leadership – LEADING IN MINISTRY TEAMS. So we understand about leading ourselves, but if you are a cell leader, a worship leader, or organizing any project or team in order to minister, what kind of leadership do we need as we lead ministry teams? First I would like to spend some time for you to understand the evolution of leadership in Church. There have been 3 dominant types of leadership, and when it was most effective is reflective of the way the dominant culture and media have influenced society. Hence leadership has had to adapt with the times in the church. There are different ages that we have gone through, most recently the last 100 over years, we have gone through the “Print Age” (up to 1950), the “Broadcast Age” (1950 – 2010) and now the “Digital Age” (2010 – onwards). During the “Print Age”, leaders were knowledge centres. They operated the church as a structure of functional units, with a hierarchical chain of command, and leaders spend much time teaching by instruction – “here is what you need to do”. During the “Broadcast Age”, the most effective leaders were motivational. They were empowering, and cohesion in the church was achieved by programs, preaching towards the mission, and the priority of relationships in church were functional to complete objectives. As we move into the “Digital Age”, the best leaders are those who are impartational. They enable collaboration, leadership is relational and transparent. Authority is dispersed, and we teach and lead by example. If you look at both how Jesus organized the disciples and how Paul organized the early church, you would see that all modes of leadership were employed. In fact, Jesus probably leaned most “digitally” in His leadership, Paul the most “broadcast”, and then the church after that the most “print”. And it is interesting to note today the reversal in that trend in the movement back towards how Jesus led his team. Different people reside in different “eras” and in order for us to be effective in leadership, and as we move towards the digital age, we also need to be sensitive that members in the community need different leadership for their own development as we move more into the digital age. Some will thrive best by specific instruction, others by motivation and inspiration, and yet others by collaboration. 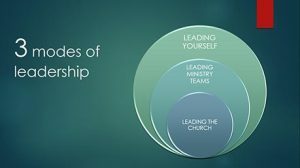 In FCC, we need to understand that as more of our members become more “digital”, as we engage a more “post-Christian” world, the kind of leaders that we need to develop ourselves to become are leaders that are impartational, collaborative, relational, transparent and that we model what we want our teams to do. So we have looked at two modes of leadership so far. Firstly, LEADING OURSELVES, which is the call of all followers of Christ. In FCC, we believe that we are a royal priesthood of all believers, which means that every member is called to minister to one another and that call us to lead ourselves. As we start to organize ministry in community, we will move to LEADING IN MINISTRY TEAMS. And we need to understand the kind of leadership we need to develop. This is the area of leadership that anyone involved in ministry teams need to understand and develop. 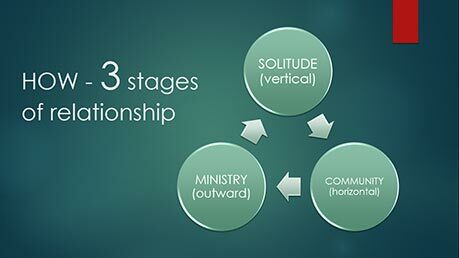 And finally, let’s look at the third mode of leadership in FCC – LEADING THE CHURCH. So what is the role of the third mode of leadership in FCC? Those involved in Leading the Church? 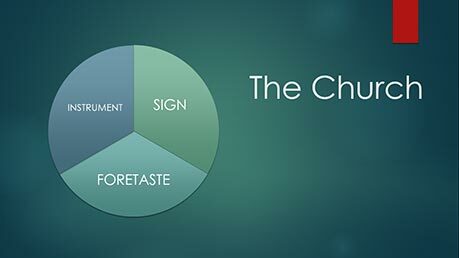 In FCC, this is the role of the Council of the church. In a month’s time after we finish the membership series, we will be electing the new Council. Any member can stand to be in the Council. So as you are considering whether you want to become a leader in this area, if you feel it is your calling and the way you want to contribute to the leadership of FCC, it is important to understand what the function of this third mode of leadership is. The first thing to understand is that those who are involved in LEADING THE CHURCH in FCC are inherently already operating in the other two modes of leadership. There are a few ways we view LEADING THE CHURCH in FCC, or whether you should think about standing for elections. Ask yourself, are you committed to membership in FCC? Are you committed to this community? Are you developing and operating in your gifts? The passage we read earlier in Ephesians 4 talked about how God has given members of the church different gifts. We are not called to minister without gifts from God. Leadership is gifted. Each of us has different set of gifts so that collectively operating together, the church can be effective. We read in Ephesians 4 five different types of gifts. 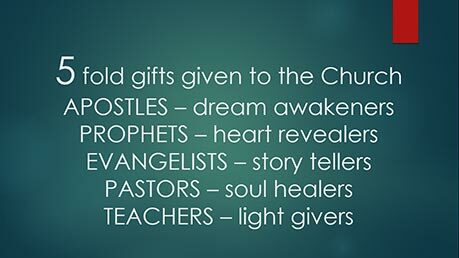 Firstly, Apostles or “dream awakeners”. They are focused on helping others living out their calling. They create a discipleship ethos and call people to participate in advancing God’s kingdom. Next, we have Prophets or “heart revealers”. They are gifted to pursuing God’s shalom, to call the church to God’s new social order and standing with the poor and oppressed. Then we have the Evangelists or “story tellers”. They are gifted to incarnate the good news, to proclaim the good news by being witnesses and being redemptive agents in the world. Then the Pastors or “soul healers”. They are gifted to help others seek wholeness and holiness, cultivate life-giving spirituality within community and embody reconciliation. Finally the Teachers or “light fivers”. They are gifted to help the community inhabit the Word of God, to engage us in scripture and teach others to dwell faithfully in God’s story. 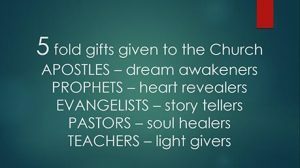 And these FIVE GIFTS are connected to the FIVE WHATS of the church is called to do. Are you passionate about developing the gifts in others? 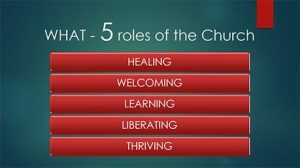 Are you committed to the mission of the church in the mission of God – to heal, to welcome, to learn, to liberate and to thrive? Are you committed to helping others do the same? What is your motivation? The Council is not the place where you tell others what to do, especially if you are not already do it yourself. The Council also does not have the role of just establishing structures although that is important as well. Those involved in leading the church are those who are there to create an environment that is open, adaptable, developing, equipping. The Council needs to be committed to enabling the community to operate well together. They are committed to the mission of the church in the mission of God. So those are the three modes of leadership that operate in FCC. Some may operate more in one mode or another, but everyone is a leader because we are all called to lead ourselves. So as a church, we approach all leadership in the following ways. We empower those doing the work. We encourage individual responsibility. We ensure there is clarity of roles. We share and rotate leadership. We foster horizontal teamwork. We learn to listen, as well as learn to talk. We seek and build consensus. 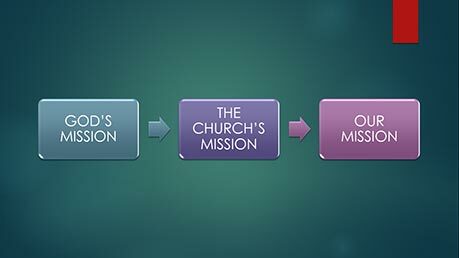 And we dedicate passionately to the mission of the Church in the mission of God. Leadership in FCC is about joining with God and working together with people and communities to out their sacred potential – living lives of daily worship to God, bringing the reality of the Kingdom to bear in our relationships at home, in the way we work, in the places we live and within the congregation, and then leading in community with God at the centre. You may say that sounds like a lot of work. Is there anything in it for me? While we respond because of God’s love and grace operating in our lives, because God calls our stories individually and as a community to join with God’s story, as we lead ourselves to break new ground, to cultivate ministry, it in turn also reshapes us. We will have joy. Not just momentary happiness but true joy in the midst of manufactured desire. We will have peace in the midst of brokenness and oppression. We will have patience in the midst of busyness; kindness and goodness in the midst of self-sufficiency and self-help; faithfulness in the midst of this temporal “for now” culture; gentleness in the midst of aggression; self-control in the midst of addiction. As we close today, I hope that you have learnt from the three sessions what it means to be a member of FCC and what it means to be a leader in FCC. WHAT is the role of FCC? It is to respond to the Great Commission and join in God’s mission to HEAL, WELCOME, TEACH, LIBERATE and THRIVE. WHY we do it? It is because of the Great Commandment to love God with all of our HEART, MIND, SOUL and STRENGTH. HOW we do it? We first build our relationship with God, then with others in community and then outward to the world, moving from SOLITUDE, to COMMUNITY, to MINISTRY. And as a community we can do all of that only when we commit to living according to our COMMUNITY LIFE PRINCIPLES. In FCC, we see all members as LEADERS – the priesthood of all believers – and we operate in three modes of leadership – LEADING OURSELVES, OUR TEAM, OUR CHURCH, with an understanding that we need to continue to develop ourselves as leaders, and recognizing that we are all gifted as Apostles, Prophets, Evangelists, Pastors and Teachers and are blessed to be broken and broken to be given to achieve the mission of the church. Amen? So how many of you are ready to be Members and Leaders in FCC?